University Alabama Press, 9780817317874, 280pp. The Myth of Ephraim Tutt explores the true and previously untold story behind one of the most elaborate literary hoaxes in American history. Arthur Train was a Harvard-educated and well-respected attorney. He was also a best-selling author. Train’s greatest literary creation was the character Ephraim Tutt, a public-spirited attorney and champion of justice.Guided by compassion and a strong moral compass, Ephraim Tutt commanded a loyal following among general readers and lawyers alike—in fact, Tutt’s fictitious cases were so well-known that attorneys, judges, and law faculty cited them in courtrooms and legal texts. People read Tutt’s legal adventures for more than twenty years, all the while believing their beloved protagonist was merely a character and that Train’s stories were works of fiction. But in 1943 a most unusual event occurred: Ephraim Tutt published his own autobiography. The possibility of Tutt’s existence as an actual human being became a source of confusion, spurring heated debates. One outraged reader sued for fraud, and the legendary lawyer John W. Davis rallied to Train’s defense. While the public questioned whether the autobiography was a hoax or genuine, many book reviewers and editors presented the book as a work of nonfiction. 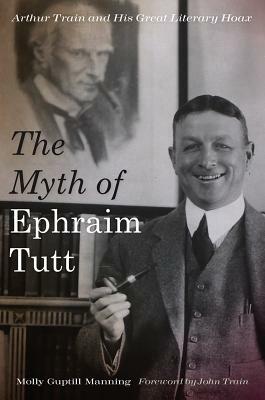 In The Myth of Ephraim Tutt Molly Guptill Manning explores the controversy and the impact of the Ephraim Tutt autobiography on American culture. She also considers Tutt’s ruse in light of other noted incidents of literary hoaxes, such as those ensuing from the publication of works by Clifford Irving, James Frey, and David Rorvik, among others. As with other outstanding fictitious characters in the literary canon, Ephraim Tutt took on a life of his own. Out of affection for his favorite creation, Arthur Train spent the final years of his life crafting an autobiography that would ensure Tutt’s lasting influence—and he was spectacularly successful in this endeavor. Tutt, as the many letters written to him attest, gave comfort to his readers as they faced the challenging years of the Great Depression and World War II and renewed their faith in humanity and justice. Although Tutt’s autobiography bewildered some of his readers, the great majority were glad to have read the “life” story of this cherished character. Molly Guptill Manning received her JD from Benjamin N. Cardozo School of Law in 2005. She is a staff attorney in the United States Court of Appeals for the Second Circuit, New York.